From left: Udo Lautenbacher (Independent Consultant), Iris Mueller (EU Expert GIZ), Nora Keck (Planning Expert GIZ) and Ferdinand Pot (Independent Consultant). On 16 March 2018, the outcomes of the evaluation related to GIZ’s Good Financial Governance (GFG) in Africa Programme were presented to the project stakeholders, partners and funders. The evaluation was conducted and presented by Nora Keck (Planning Expert GIZ), Iris Mueller (EU Expert GIZ), Ferdinand Pot (Independent Consultant) and Udo Lautenbacher (Independent Consultant). 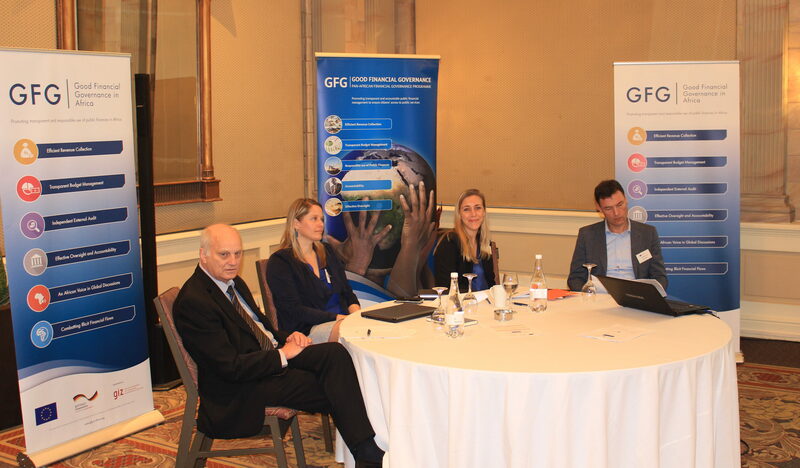 The GFG programme is aimed at supporting development and piloting implementation of coherent approaches and standards of public finance systems by strengthening networking organisations in the field of Good Financial Governance. The GFG in Africa programme in particular supported Pan-African oriented networks such as African Tax Administration Forum (ATAF), Collaborative Africa Budget Reform Initiative (CABRI), African Organisation of Supreme Audit Institution (AFROSAI), African Organisation of Public Accounts Committees (AFROPAC) and fostered the co-operation with further continental bodies. Additionally, the programme supported the incorporation of African interests and needs (African Voice) into international discussions and decisions processes related to global public finance matters. In evaluating the GFG in Africa programme, the review took place in Cameroon, the seat of the AFROSAI General Secretariat, and South Africa from 05 March until 16 March 2018. The review process included the analysis of documents, interviews with key stakeholders, partners, beneficiaries, civil society, the EU delegation to South Africa, German embassy and international development partners. Effectiveness: the programme was found to be “very successful”, as nearly all indicators are achieved or will be met by end of 2018. Impact: Regarding the question whether the programme will help achieve overarching long-term objectives it was rated as “successful”, as three of the Pan-African networks have been strengthened and some African positions -related to tax and other public finance matters- have been brought in and reflected adequately in the international discussion and decision-making processes. Efficiency: the programme’s efficiency was also rated as “successful”. Principally the relationship between input/output as well as the allocation of the resources has been good. Sustainability: sustainability was rated as “rather successful”. Even though the networks have been strengthened, they still lack institutional and financial sustainability which will have to be achieved in the long run. This is recognizing the fact that the networks have reached such a grade of maturity that they will not disappear and that especially the obtained international awareness and reputation of the “African Voice” will continue in a relevant manner. GFG in Africa partner networks representatives attending the evaluation workshop.